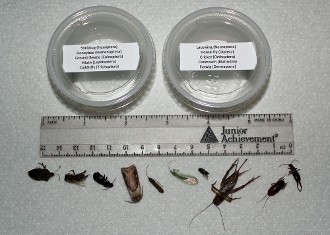 This USA specimen kit includes everything that is in the 20 specimen collection, plus ten more specimens and one additional insect order (Zygentoma). To summarize, this kit includes 12 different insect Orders containing 30 different insect Families. So, you get 30 different specimens of dead insects (30 different species) and 30 pins. The table below lists this information in an easier to understand format. Please note that some specimens are small or soft-bodied and ship in alcohol (70% alcohol in 1.5 milliliter microcentrifuge vials) as denoted by asterisks in the table below. These and all the other species are usually collected within the last calendar year and have been stored in the freezer to maintain both their appearance and, when thawed, their flexibility. That means no chemicals (relaxing fluid) are typically required. If needed, you can put them in water that has been boiled and set to the side for a few moments. If you don't plan to use the thawed specimens on arrival, simply place them back in the freezer until you're ready. Also, note that termites are now considered to be in the Order Blattodea, although much literature still refers to them as being placed within the Order Isoptera. Similarly, Leafhoppers and Treehoppers may be placed by some older references in the Order Homoptera. All specimens (including ones in vials) are packed between layers of soft tissue paper within portion cups (small condiment cups with lids). These are wrapped in cushioning newspaper and overboxed with a cardboard box for shipping. Please see Terms and Conditions page for more information about our policies and shipping services. Many specimens are large enough to accommodate a pin stuck through them, but you may find that small and/or fragile specimens are more easily glued to paper tabs with pins (first) stuck through the paper tabs (see Oregon State University Website). This is the conventional method for displaying small specimens. We include a few duplicated specimens for you to practice pinning (Sorry, no special requests as to which ones you get as freebies). Duplicate specimens are shipped for your to practice with (sorry, no requests on these free extras).